Sometimes I find myself out on a shoot and in need of a light stand but don’t really like bringing extra gear when I don’t have to. Many times I wish that I had some kind of long pole to hold up a diffuser or silk that would enable me to have the ability to capture a more wide angle feeling possibly without the diffuser anywhere near the frame. Photoflex designed a system called the Lightreach Plus that pretty much works just like I was hoping for and they wanted me to test it out in the field. Using my friend Tiffany and a couple of assistants, we headed up to the one of a kind Goldmine, in the city of Jerome, not too far from my home in Sedona, Arizona. This place is a photographer’s paradise with about a million old junk cars, dilapidated machinery and rambling broken down shacks as far as you can see. I love great locations for so many kinds of shoots and this one was perfect for things like HDR but also for testing out this new gear from Photoflex. They sent me the new Lightreach Plus pole system and also their 39″ x 39″ Lite Panel diffuser and all the hardware. 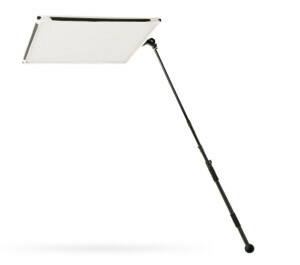 I have had other similar systems in the past that were made out of plastic and bent and were pretty difficult to use so they actually sat on the sidelines most of the time. 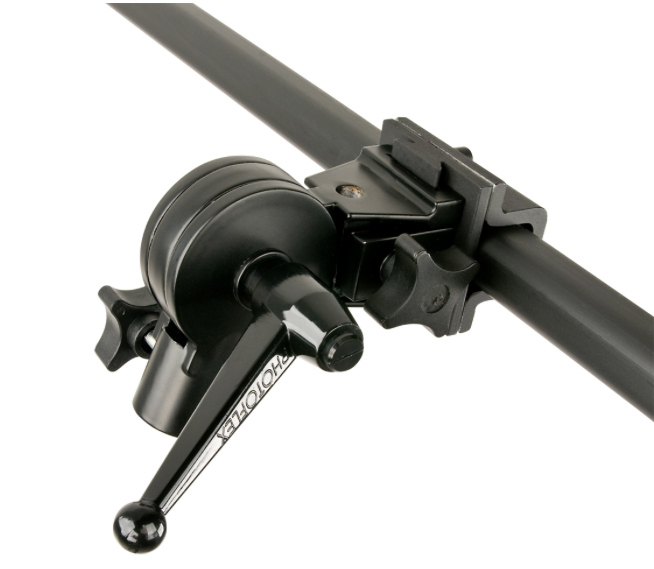 This new system is made all out of metal and is so well designed that I knew it was perfect for any kind of condition outdoors including windy situations that make it extremely difficult at times. I decided to test it out before we got to the Goldmine and stopped at a broken down old gas station on the way up to the town of Jerome. It proved to be a great location for my first test with the system. 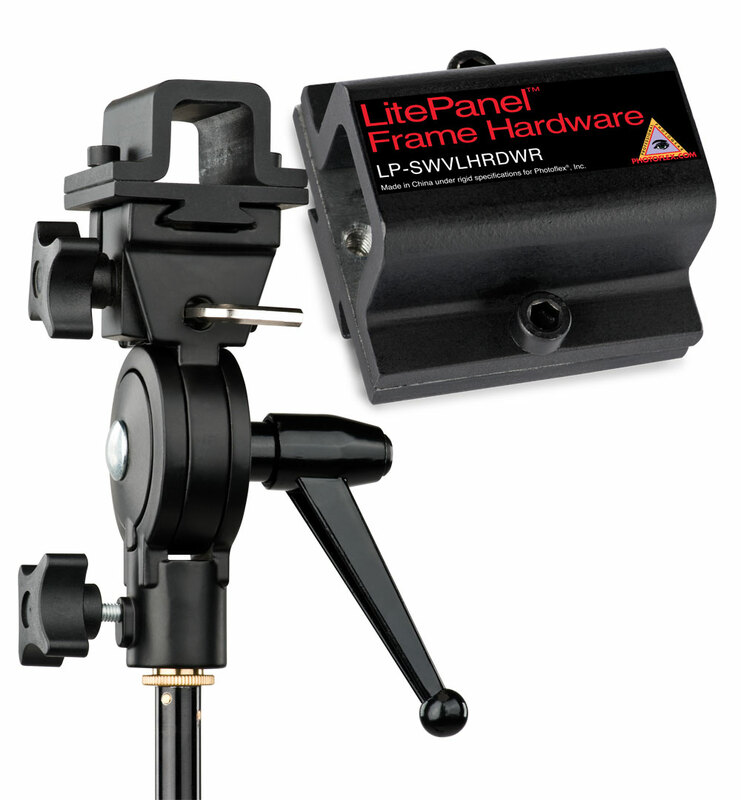 These are some images of the system including the aluminum frame of the Lite Panel, the heavy duty Lite Panel hardware and the Lightreach Pole. Their Lightreach pole is incredibly beefy and extends probably farther than you’ll ever need it which is great but it is so much stronger than anything else I’ve seen in the past. 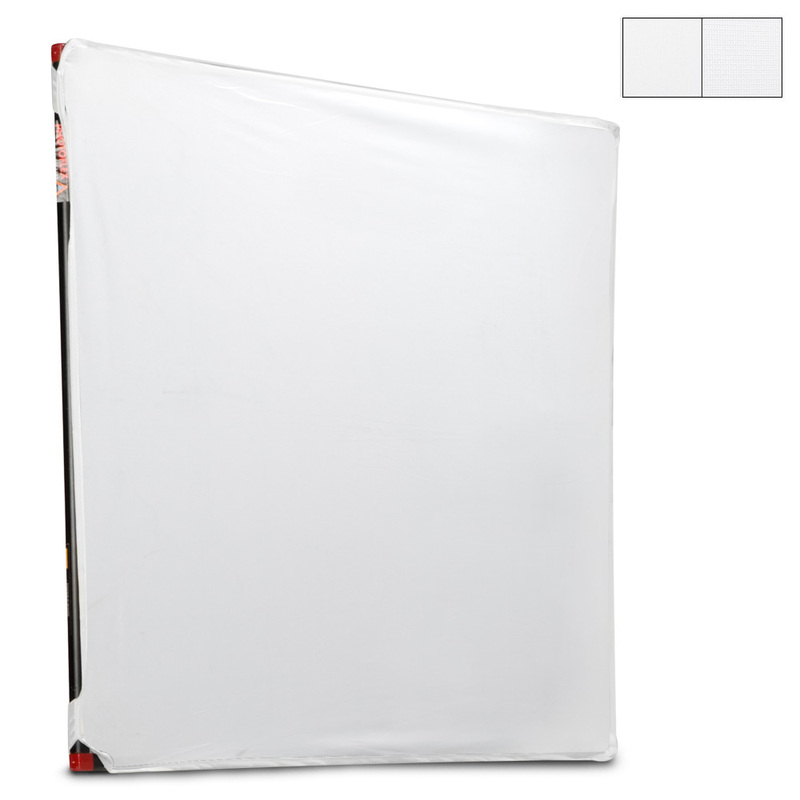 It immediately makes you feel that you can hold a reflector, diffuser or any kind of soft box extremely high and out of the shot without worrying about the system falling apart. On this shoot with Tiffany, I decided just to use a diffuser as the natural light outdoors was probably going to be what I wanted for this shoot but just wanted her face softened by the diffuser. 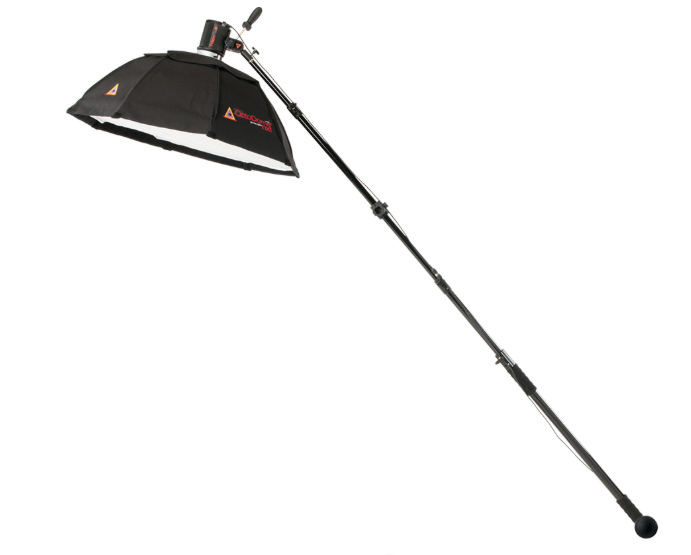 In the image above, this shows Patrick holding the Lightreach pole against his thigh with the 39″ Lite Panel with diffuser way above my car and above Tiffany’s face and body. Although the car still has too much sunlight on it, I knew I would only be shooting Tiffany and the angle of the diffusion worked out perfectly. That enabled me to get different kinds of angles of her whether from either side or directly in front of her with the broken down building in the background. Although it was pretty windy at the time, Patrick was able to hold onto the pole without any problems although I did remind him quite often not to dent my car! It really proved to be no problem to hold the system high above and he had no complaints whatsoever. The hardware is built so incredibly well that it locks down super tight and you really have a comfortable feeling about it as I do not like cheap gear whatsoever and this stuff is rock solid! The first two images below show Tiffany without any diffusion and with the light panel and although the differences are minor, when you do not want any part of your subject blown out from the sun, then using diffusion in bright sunlight is an amazing way to control the situation. You can easily see with these two images above how using diffusion in contrasty situations can give you a much more soft and pleasing light quality, eliminating shadows and giving you the ability to shoot in bright sunshine. Even her cowboy hat has a completely different look and feel but it’s the harsh line from the sun going directly across her face that is pretty distracting along with all of the sunlight that is not flattering whatsoever. What’s so nice about this well-designed Lightreach pole is that my assistant was able to be far enough away from the model and at the same time hold the diffusion high enough so that I had all kinds of options to photograph her. 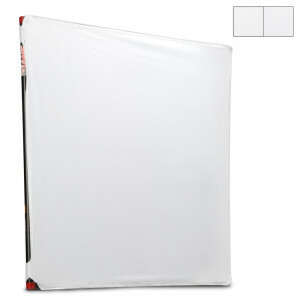 So often, assistants are holding the diffuser or reflectors and can only be so far away and hold them up only so high. Using light stands do help at times but you are constantly moving them and they can blow over so easily outdoors. Having the ability to hold diffusers and reflectors at angles like this and be able to move this way or that way at the direction of the photographer is a huge bonus to any shoot, especially outdoors. I found this system to be incredibly easy to use and exactly what I had been looking for for a very long time! And with diffusion to alter the sunlight, this can produce an almost ethereal soft wash of light that can make people look gorgeous and that’s why it is used in the movie business all the time on so many scenes. Using silks or diffusers are the key to managing the harsh light outdoors and anything that can help the shot is a bonus! With the two shots below, the first one was shot with a 24-105mm on my 5D Mark 2 and the second shot was shot with my 500mm on my 5D Mark 3. Two completely different perspectives but both show the advantages of using a system like this as it gave me just the kind of soft light that I was looking for. 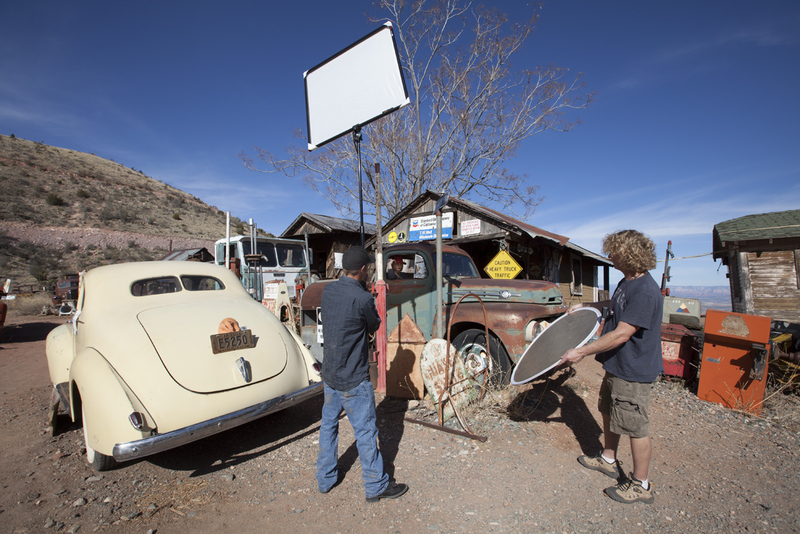 I wanted to try something different different once we got to the Goldmine as I wanted to have Tiffany inside one of the old cars up there but wanted to use the same set up with the 39″ Lite Panel and Lightreach pole. I actually was getting pretty addicted to this system as there have been so many times when I wish I could have had reflectors or diffusers or even a soft box way up in the air without having to use light stands or even a ladder. Once you have something like this to use, you actually look for reasons and locations to come up with something different. This location with so many broken down old cars was perfect to test this out and I purposely made sure I was there at a bad time of the day with the sun high up to show people that you can shoot almost at any time of the day as long as you have the right gear. I had Tiffany sit inside an old beat up Ford pickup truck and then had Patrick once again hold the Lite Panel way above her to block out the sunshine that was behind us and above. This time, I had Patrick place the huge rubber ball end of the Lightreach system on the ground as this proved to be such a better idea rather than hold the pole against his leg like we had done in the previous shot. Photoflex let me know that this method was highly recommended and it proved to be just what we needed with this gear. All that Patrick had to do was lock in the Lite Panel just where it needed to be and then hold up the pole, resting it on the ground and cast diffusion across Tiffany in the front seat. Having him hold the diffuser so high and also further away enabled me to be able to shoot her from different angles and from different distances. In the image above, you can see the setup that we were using with Patrick holding the Lite Panel high above and I was showing my other assistant how to hold the soft gold reflector to bounce in some more light on Tiffany’s face. I then was able to get in pretty close to her and get some shots of her without all the contrasty lighting. The two shots below are similar but different and would never have been able to have been captured like this without having great gear to alter the light. I also did shoot that day with just my soft gold reflector and no diffusion and the following one was just from my reflector. I would have to say that there is nowhere that I travel on this planet without my Photoflex soft gold reflector and diffuser in my backpack. The images that these two discs have enabled me to get have been too many to keep track of and it’s one thing that I tell all of my students to carry with them also. Coming across great photo opportunities all over the world is one thing…. but having the right gear to get just the kind of shot you want is crucial! I mentioned that I love shooting HDR in great locations but for me the secret of HDR is not making it look like it is a typical HDR shot…. one that is over processed and looks completely unnatural. There are all kinds of different software out there but so often everyone’s HDR looks the same as they don’t try to finesse it into looking a little more natural. Sometimes layer masks are all you need and sometimes good HDR software and a good eye on keeping things looking more natural is all you need but shooting in horrible light is always a difficult situation. The following image is a panorama that I did only using a soft gold reflector but I tried to give it an HDR feel to it without shooting all of the images in HDR. Sometimes I like to do an HDR panorama… which involves quite a few images but on this particular panorama, I decided to just use Nik Color Efex Pro and some of the cool filters inside of that plug-in. It would have had a similar feel if I had done an HDR panorama but it’s pretty easy to get an HDR feel to many of your images using Photoshop creatively and also using some of the pretty cool plug-ins that are out there. This one looks a little dramatic but with all the old cars I decided to be a little more heavy handed than usual. My mission that day was to try out the new system from Photoflex and I can say I came away pretty happy with this rock solid well-designed gear. Being able to be portable in the field with equipment that is needed is a niche that they were trying to fill and it absolutely worked as smooth as silk! It helped me create images that would have been a lot more difficult if I did not have this new system and all I can say is great work on some very cool products Photoflex!! This stuff is going to make a lot of photographers very happy!